The ancient town of Poreč on the west coast of Istria never fails to attract a steady stream of tourists all year round. This characterful and picturesque town has a long history, dating back to Roman times. Its Roman past is evident in the layout of the town, which is typically Roman with two main streets intersecting a mostly symmetrical design. Being the first Roman colony in Istria, alongside Pula, Poreč is literally laden with fascinating ancient buildings and sites, including Roman temples, Gothic, Romanesque and Baroque palaces and medieval town walls and fortresses. 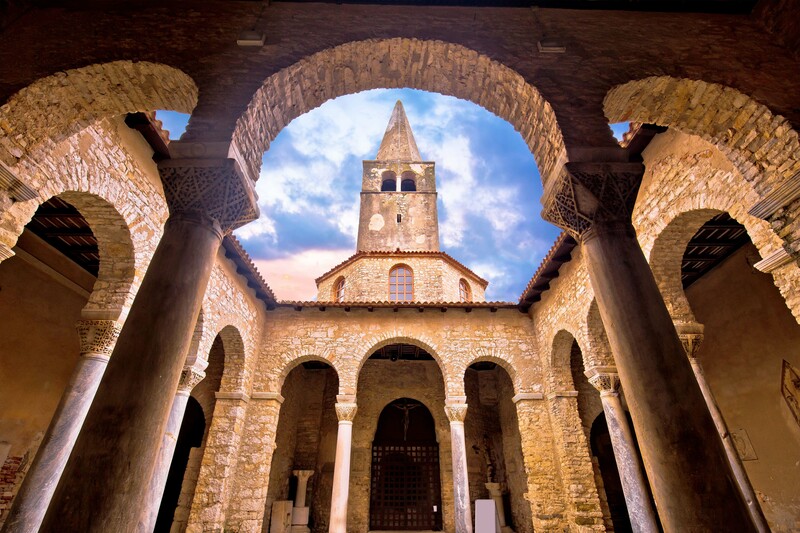 One of the most iconic, domineering and heavily-visited sites of Poreč is its Euphrasian Basilica. This stunning Basilica is one of the best-preserved early Christian structures and most significant historical buildings in the world, hence why, in 1997, it was given UNESCO World Heritage status. The earliest part of the Basilica dates to the second half of the 4th century. The original mosaic floor from part of a large Roman house, is still preserved in the garden of the church. The Basilica was built in the 6th century when Bishop Euphrasia came to Poreč and was unable to accept the humble existing church in the town. Consequently, the Bishop decided to build a Basilica that was inspired by Byzantine art and one he would be remembered by. Euphrasia’s identity can be found in different spots around the church, including his initials inscribed in prominent places and his picture as a saint in a mosaic. One of the most striking features of the church are the magnificent mosaics that adorn the top of the apse. This striking artwork tells fascinating stories of mankind’s thoughts and aspirations from around 15 centuries ago, including the Virgin Mary dressed in Byzantine clothing with her head partly covered by a veil symbolising her virginity. Visitors can climb to the bell tower of the Basilica and take in the magnificent views of this captivating city below.